Hockey in Heels Heads Outdoors! 01/08/2018 - CLICK HERE TO PURCHASE TICKETS FOR HOCKEY + HEELS! 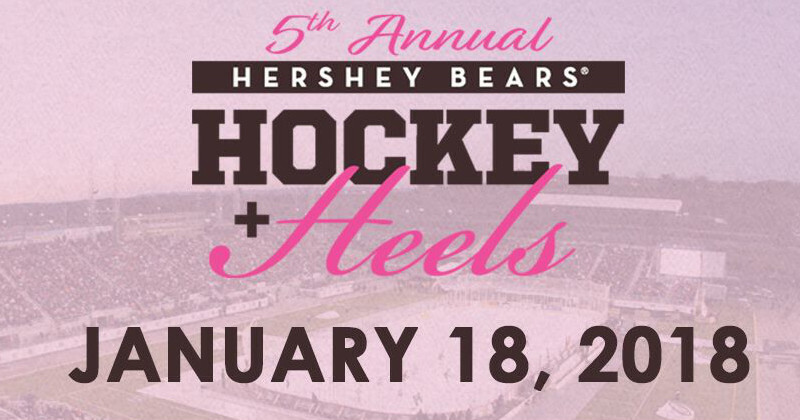 The Hershey Bears are proud to announce our 5th Annual Hockey + Heels event will be revamped for a special OUTDOOR EDITION! Female fans will learn how the rink was built, hear player stories, and skate on the Outdoor Rink! The fan Favorite event is scheduled for Thursday, January 18, 2018 ahead of the 2018 Capital BlueCross Outdoor Classic. Check-in for the event will be from 5:30 p.m. – 6:15 p.m with the event taking place 6:30 p.m. – 9 p.m. (Light meal included at conclusion of event). Tickets are on sale NOW! The cost is just $60 per person (plus processing fees). Ticket price includes light buffet dinner with two (2) drink vouchers. A portion of ticket sales will go to the PA Coalition Against Domestic Violence. You must be 21 years or older to attend the event. Ticket purchases are online only. Sessions subject to change.